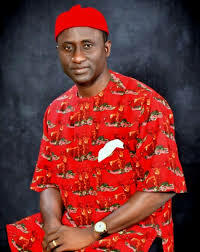 A Governorship aspirant of the Peoples Democratic Party(PDP) In the December 8 2014 Governorship Primaries of the Peoples Democratic Party in Abia State and President Of Masters Energy Oil and Gas Dr Uchechukwu Sampson Ogah has defected to the All Progressive Congress(APC) in Abia State. Uche Ogah Contested the Governorship Primaries of the Peoples Democratic Party in 2014 but lost to Dr Okezie Ikpeazu who emerged winner of the December 8 Primaries of the PDP in a wide margin. Ogah who recently lost at the Supreme Court on the tax suit Instituted against Governor Okezie Ikpeazu secretely defected to the All Progressive Congress in his Ward in Uturu Isiukwuato Local Government Area of Abia State. APC Publicity Secretary in Abia State Comrade Ben Godson Yesterday clarified the rumour of Dr. Uchechukwu Sampson Ogah being a member of All Progressive Congress (APC). The APC spokesperson for Abia State made it open that Dr. Ogah is now a full member of the party and was even elected as part of the delegates that will represent Isuikwuato and Abia state in the APC non-elective convention coming up soo. PUO REPORTS has exclusively learnt that Dr Uchechukwu Sampson Ogah will contest the 2019 Governorship election in Abia State on the Platform of the All Progressive Congress.